Please note: This article is intended for event organizers who process sales with their own merchant account. If you are not using your own merchant account, you can submit refund requests to refunds@showclix.com. If you are interested in processing sales with your own merchant account, please contact clients@showclix.com. If you have purchased tickets from ShowClix and want to know more about our refund policy, please call our customer care center at 1-888-718-4253. A refund cannot be processed against a credit card payment until the funds have settled. This process may take up to three business days after payment is made, depending on which payment gateway was used. You may still submit the refund, and the system will process the refund automatically after the funds have settled. You will be notified via email when the refund has successfully processed. 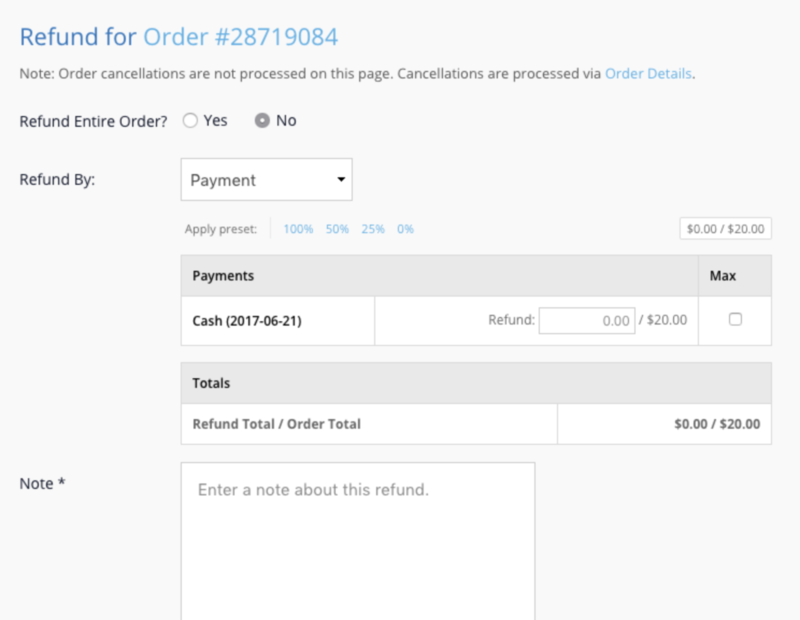 As noted above, when issuing a partial refund, you can select presets for 100%, 50% or 25% of the order total. You can also select to include All Service Fees or No Service Fees.